UFCW members make a number of the Thanksgiving staples we know and love—Butterball turkey, Dole cranberry sauce, Kraft stuffing, Reddi-wip. But there’s another Thanksgiving tradition that our members have a hand in that has nothing to do with food: football. Watching football on Thanksgiving has its roots in the 19th century. Americans have been celebrating Thanksgiving since President Lincoln declared it a national holiday in 1863. Not long later, rival college and high school football teams began facing off on the holiday. Princeton played Yale in the New York City area on Thanksgiving Day from 1876 through 1881. In 1882, The Thanksgiving Day football game became an institutionalized schedule of organized football. The National Football League (NFL) wasn’t founded until 1920, but since it’s inception, it’s embraced the Thansgiving game day tradition. For the past 60 years, UFCW members at UFCW Local 1546 have been handcrafting the official NFL football leather at the Horween Leather Company in Chicago, Illinois. 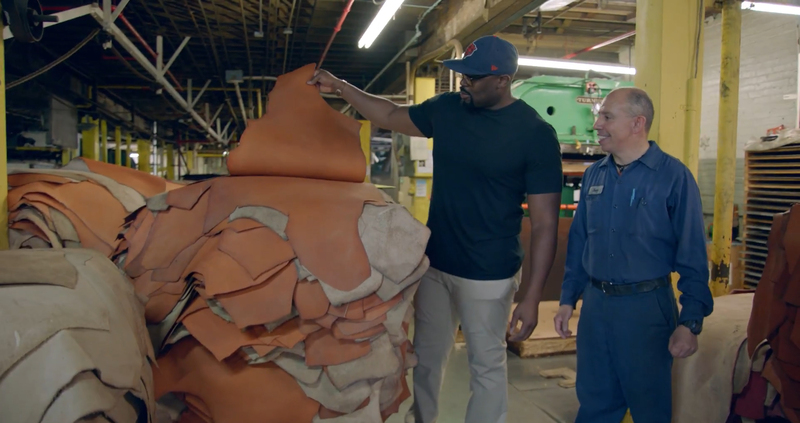 Former NFL player Israel Idonije recently visited the plant to learn more about how the UFCW works together with management to ensure both high quality leather and good, sustainable jobs.